1.We make efforts with oneself for the necessary thing. 2.We do not overdo and will not continue. 3.So, our company does not have the useless thing. At all times, we make a judgment instantly. 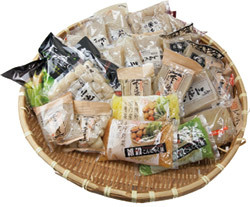 We make the highest Konjac every day. Each employee has a pride. We widen konjac culture in the world. ISHIBASHIYA CO.,LTD. makes konjac with the unique manufacturing method called [Bata-Neri]. There are few companies manufacture by this production technique now in Japan.A unique texture and the taste soaking in are excellent. According to trend of the times, we introduced a machine of the automation once.However, we discarded of all machines in around 1993 and placed the [Bata-Neri] as the main manufacturing method.We sell the products in around mainly on a department store and a high-quality supermarket of all over Japan.We began overseas development in 2002 to extend the possibility of the market expansion. In parallel, we investigate possibility of the Konjac in cooperation with an overseas company and university. 1877Kamezirou Ishibashi (the first) is establish in Ginsui-Omuta. 1922Tokuzirou Ishibashi and Toku became the second generation. 1945To suffer damage by air raid, the company moved to Shirakawa-Omuta. 1951Takasuke Ishibashi became the third generation. 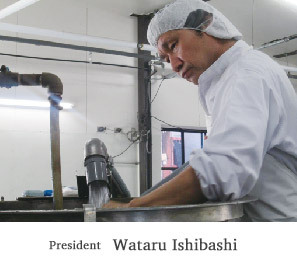 1976Wataru Ishibashi (current president) entered the company. 1981The factory moved to the current place (Omuta-Kamiuchi). 1990Wataru Ishibashi became the president of the fourth generation. 1992Established a limited company (capital stock: 3 million JPY). 1994Capital increases to 8 million JPY. Automation system is abolished, returned it to [Bata-Neri] which is the origin. 2002Shipped products abroad for the first time. 2005New business for foreign countries started in earnest. Zakkoku-Konnyakumen is released. 2007Collaborative research with the Fukuoka University is started. 2008Has been adopted to Kyushu Industrial Technology Center Innovation Business. 2009Won The Venture grand prize award of excellence, New business grand prize encouragement prize and Ministry of Economy, Trade and Industry of 300 company of manufacturing. 2010Management innovation plan was approved. 2011Has been adopted to The Kyushu Bureau of Economy, Trade and Industry local resources utilization business. 2012Won The fourth Manufacturing Japan grand prize [Kyushu Bureau of Economy, Trade and Industry director award]. Redecorated the factory. 2013Has been adopted to The overseas joint advance support project. Copyright © ISHIBASHIYA. All right reserved.